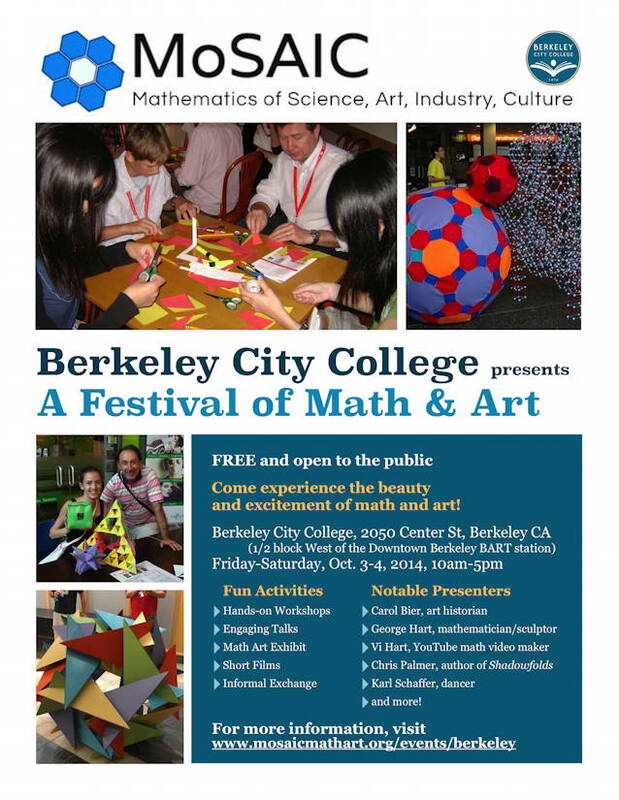 Berkeley’s Mathematical Sciences Research Institute (MSRI) and Berkeley City College will host MoSAIC: Mathematics of Science, Art, Industry and Culture: a Festival of Math and Art 10 a.m.-5 p.m., Fri. & Sat., Oct. 3 & 4. The event is free and open to the public. MoSAIC is a collaborative effort sponsored and funded by MSRI and administered by the Bridges organization. The groups create interdisciplinary mini conferences and festivals on mathematical connections in science, art, industry, and culture for colleges and universities around the United States and abroad. The BCC event will include hands-on workshops, presentations, math/art exhibits, films and information exchanges with mathematicians and artists. Notable presenters include Art historian Carol Bier, George Hart, mathematician and sculptor, Vi Hart, YouTube math video producer, Chris Palmer, author of Shadowfolds, Karl Schaffer, dancer, and more. 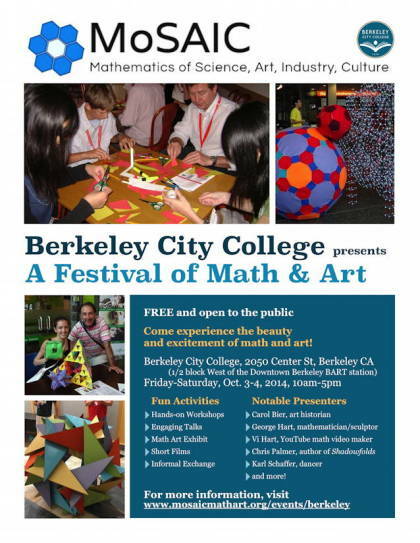 For details, visit www.mosaicmathart.org/events/berkeley.